Tag Archive | "Matthew Shoffner"
Many of those demanding the resignation of the Superintendent marched to Cedar Springs High School from the Hilltop building Monday evening. Photo by Aleshia Smith. 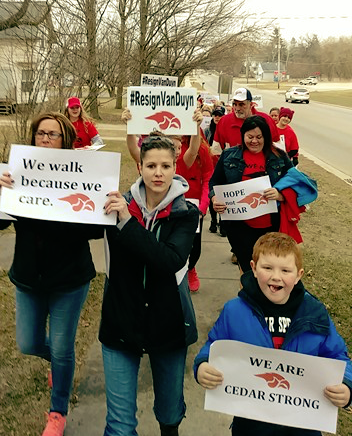 After several years of complaints from teachers and community members against Cedar Springs Superintendent Dr. Laura VanDuyn, the Cedar Springs Board of Education voted Monday evening to accept her resignation. The main complaint was of creating a hostile and toxic work environment, with a turnover of 70-plus employees in the last three years. Several complaints of bullying had also been lodged against her in the past but dismissed by the Board of Education. Many who had voiced comments against the Superintendent at previous board meetings felt the board was not listening or did not care. That fueled a movement that recently grew in the community to get their voice heard. A sea of red shirts sporting the logo “#ResignVanDuyn” filled the auditorium at Cedar Springs High School before the regularly scheduled board meeting Monday night. Many also held signs with the same logo. The group, made up of parents, teachers, and other community members, had come to demand that either the board put the Superintendent on immediate leave pending an investigation, or that they negotiate with her to resign. They also had petitions for the recall of three board members. 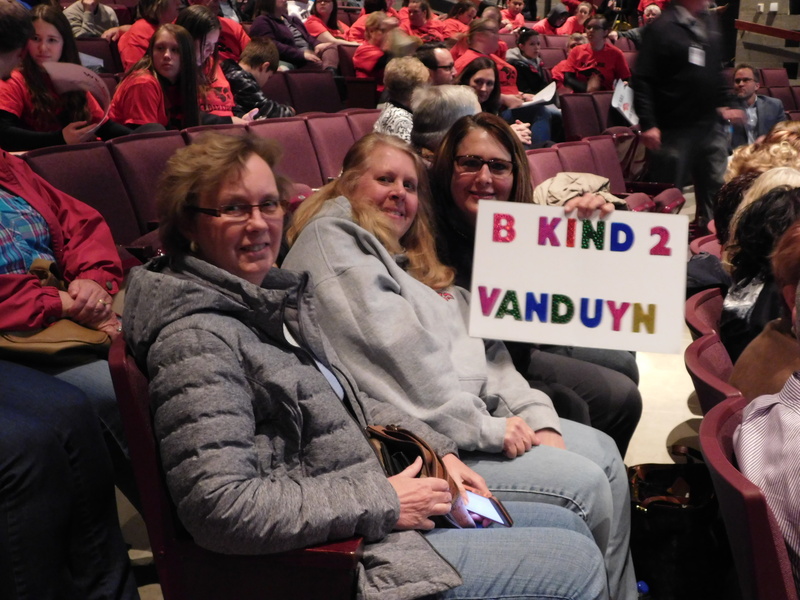 Signs in support of Superintendent VanDuyn. Post photo by J. Reed. As the board members filed in at the start of the meeting, one person was conspicuously absent: Dr. VanDuyn. Board president Heidi Reed announced that the Superintendent had been excused from the meeting. After making some introductory statements about the board, they made a motion to go into closed session to discuss “a personnel matter.” After more than an hour of deliberation, they reconvened and made a motion to accept the resignation of Dr. Laura VanDuyn. Cheers filled the auditorium as the motion was announced. The vote passed 5-1, with Board trustee Tim Bauer the lone no vote. Trustee Shannon Vanderhyde was not present. Bauer, who was appointed earlier this year to fill an empty seat, said he felt it was wrong. He noted that many of those wearing the red shirts had probably went to church on Palm Sunday. He then compared them to the angry mob that had crucified Jesus when they didn’t get their way. A Facebook post by Bauer Tuesday morning speaking of judgment on those that wore the red shirts caused more furor and scrutiny by law enforcement. He later announced on Facebook he would resign at the next board meeting. Board Vice President Matthew Shoffner gave one of the most heartfelt speeches from the board. “I hoped for something better and that has not come about. I hoped for unity and I hoped for this community to be brought together. That is still my hope. I hope that we can do this together,” he said. Katy Austin, one of the founders of the “Cedar Strong” movement, was one of those thankful that the board finally heard their voice. “I’m incredibly thankful to each and every person who helped the community be heard. I’m excited for the future and I can’t wait to see our kids soar,” she said. Dr. VanDuyn will remain at Cedar Springs through the end of the week. 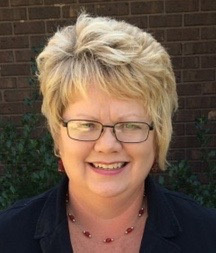 An announcement from Board President Heidi Reed said VanDuyn would also continue as an ad-hoc consultant through June 30, 2018. Reed noted that the Superintendent still has many supporters in the district. “During her almost four years with our District, Dr. VanDuyn’s leadership has blessed our district with talent and new ways of thinking while challenging us to rise to a higher standard. “Dr. VanDuyn’s top priority has always been the children and creating the best environment to promote academic growth and development. Her exceptional beliefs and leadership built a strong foundation for our journey to excellence. The board is thankful for Dr. VanDuyn’s dedication and service to CSPS and we wish her well in future endeavors,” she said. The board appointed Mark Dobias, former superintendent of Allegan Area Educational Service Agency (AAESA) and Fennville Public Schools as interim Superintendent. He is scheduled to start on April 9. “Our strong building leadership coupled with his operational background will assure a seamless transition as we begin the search process for a permanent replacement,” said Reed. The Cedar Springs Board of Education will have a new president to lead the board in 2018. The board voted in Heidi Reed 6-0, at its annual reorganization meeting Monday evening, January 15. She was nominated by Brook Nichols. 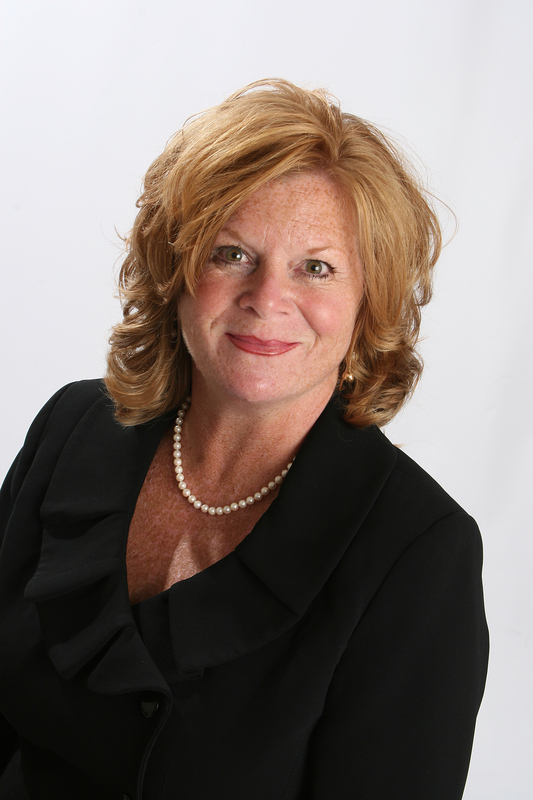 “I am humbled and honored by the support of the entire board of education team to lead this year as President,” said Reed, who is just starting her second year on the board. Matthew Shoffner, who was previously president, was voted in as Vice President, 6-0. In his remarks during the “gratitudes” section of the meeting, he noted that the board had been through quite a bit and he would miss the board members that had left, but was grateful to those that had stayed. Brook Nichols was voted in as secretary, 6-0, and Shannon Vanderhyde was voted in as treasurer, also 6-0. The board will meet again next week, Tuesday, January 23, at 6 p.m. to interview candidates to fill the seventh seat on the board, which was previously held by Patricia Eary, who resigned at the beginning of Monday night’s meeting. 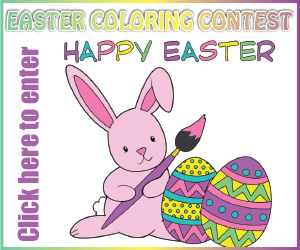 (See story here). January is School Board Recognition Month – An opportunity for us to celebrate the great things happening in our schools and the dedicated volunteer school board members that serve the Cedar Springs community. School board members are regular citizens, like you and me, that have an extraordinary commitment to the children of our community. Today, our school board members are entrusted with the important work of shaping the education of our youngest citizens. They dedicate countless hours to creating the mission, vision and goals that drive our schools. They are dedicated to creating a school culture where collaboration and continuous learning are valued and displayed throughout our system. The seven members of the Cedar Springs Board of Education do this by always keeping children as the center of their work and decision making. 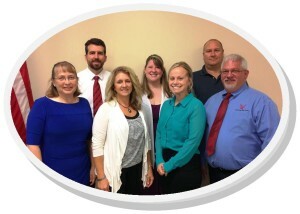 Please join me in saluting the men and women who serve as members of the Cedar Springs Board of Education. Take a moment to express your gratitude for this important service to our community.